Such a ritual can be used to encourage creativity and growth of all kinds. It may be performed either alone or in a group, with everyone present joining in the chants. Use as many kinds of wood as possible in the kindling for your fire. Traditionally the magical trees were oak, ash, thorn, willow, birch, rowan, alder, holly and yew, but you can use wood indigenous to your region. An arboretum will offer a variety of fallen twigs. * Light a small fire. (This may be either a small bonfire out of doors, or a fire in a hearth indoors. Barbecue pits are easily adapted.) If you are working in a group, each person can ignite the fire at a different place. If you cannot light a fire, choose a really large, fat, dark green candle as your focus. Place it on a wide, deep fireproof tray, secured in sand. * If you are in a group, stand in a circle around it, with each person holding a taper. The first person lights their taper, then the flame is passed from one taper to the next until the person holding the final taper lights the central candle. Each person can say the chant, with one voice after another joining in. fire of Bel, fire of the summer Sun and the ascending light, flame in my heart, my soul, my loins, that my life and light maybe kindled and flare upwards to greet the summer Sun. Light, we greet your dawn. fire of Bel, join with my fire and with all fires in all places on this day at this hour, rise in a web of glorious flame to empower the Sun, to be empowered and to flame within my heart forever. 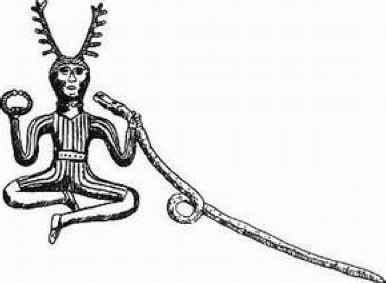 * Cast the twig into the flames, then leap high in the air, crying: Ascend and bring fertility, power and creativity. I do not suggest you try to emulate our ancestors and leap across the flames, as presumably the casualty rate was horrendously high. * If you are using a candle, each person can in turn hold the end of the twig in the flame until it smoulders, then rest it on the tray and allow it to burn slowly down or go out. * End the ritual by taking scarlet ribbons and spiraling round the fire or candle, waving them like flames, as you chant. Finally throw them into the air, away from the flame. * Allow the fire or candle to burn down. Afterwards, make up small posies of flowers to leave on the doorsteps of people who you know would appreciate them - perhaps the ill or lonely.